On Wednesday, Microsoft offered the first glimpse of Windows 8, a sneak peek that reveals much about both the influences and the strategic goals of the major overhaul of Microsoft’s 25-year-old operating system. Although Microsoft didn’t offer any details, the start screen that it is showing on Wednesday includes a prominent link to a store, ostensibly confirming that Microsoft plans to get in the business of directly distributing Windows programs, much as Apple has on both the iPhone and Mac. Sinofsky noted that there were a few things that the iPad showed were missing from Windows–most notably a touch-first interface and an app distribution mechanism and new business model for developers. Windows 8, as the product is currently code-named, is designed to address all three of those issues, while preserving compatibility with decades of existing Windows programs. 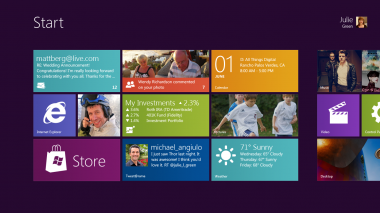 Although Windows 8 is clearly influenced by the iPad and other mobile devices, the plan for the new operating system has been in the works since Windows 7 shipped in July 2009–several months before the iPad was first shown. Microsoft has also done work with the classic Windows desktop to make it more touch friendly, including using a new kind of “fuzzy hit targeting” to adjust for the fact that fingers are far less precise than a mouse. The goal, says chief designer Julie Larson-Green, is that classic apps, though designed for a keyboard and mouse, work well with touch. Apps taking advantage of the new programming layer, she said, are designed for touch first, but also work well with a keyboard and mouse. Windows is growing more flexible in other ways. Microsoft said back in January that the next version of Windows would support ARM-based chips from Nvidia, Texas Instruments and Qualcomm, in addition to the traditional Windows processors from Intel and AMD. Though Sinofsky and Green used Intel-based machines for Wednesday’s demo at D, Microsoft plans to demonstrate some of the ARM-based designs later today at the Computex trade show in Taiwan. On a technical note, Sinofsky stressed that after decades of ever-increasing system requirements that characterized Windows releases through Vista, Microsoft is once again building an operating system that demands fewer resources than its predecessor–a trend started with Windows 7, which worked on all Vista-compatible systems. A key question is how well this new Windows will stack up against a new generation of “post-PC” devices running Android, Apple’s iOS and other operating systems. There are other unanswered questions as well, including just when Windows 8 will be ready. Sinofsky declined to say, but said Microsoft will have a lot more to say about Windows 8 at a developer conference in mid-September in Anaheim, Calif. This is becoming an ecosystem game. And that’s where the future of this industry is.